As a young family, we're slowly creating a number of traditions; things we do each year or season around the same time. We give each other a book on Christmas Eve, we spend a night in a hotel in Amsterdam for my partner's birthday and we try to get away further afield for mine. I think we can now call cycling the route of Amsterdam Light Festival a tradition as we've done it most years. However, this was the first time I took my camera with me and took some photos of this special light festival that brightens winter in Amsterdam. 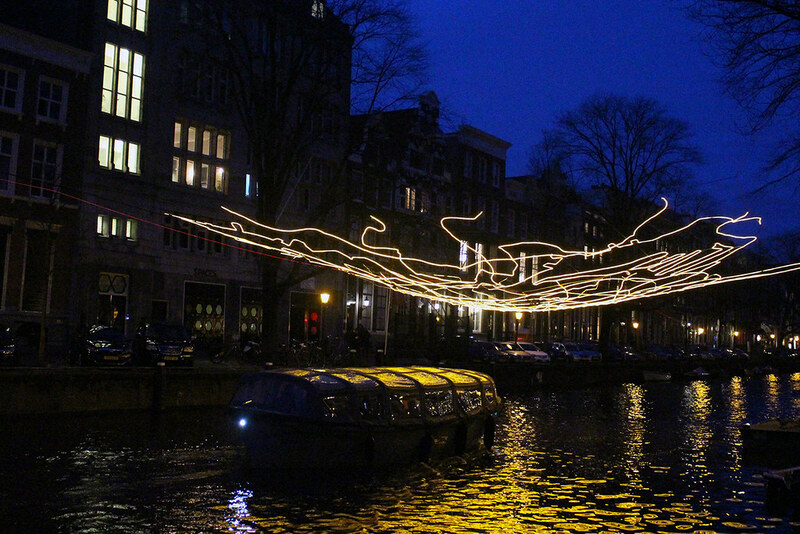 Let's be honest, these are not the best photos you'll ever see of the light festival in Amsterdam. They're noisy and blurry and of course a bit dark, but they'll do. They still capture something about not only all the Amsterdam Light Festival installations but they also reveal a bit of what Amsterdam is like in the dark; cosy, quaint, intimate and yep, pretty darn beautiful. I took these photos on quick stops around the route for Amsterdam Light Festval which this year (2018) was all around the Herengracht. I think it usually is roughly the same each year though the installations change. For more information about what all the installations featured her represent, check out the Amsterdam Light Festival website, and while the festival has now sadly ended until the 2019 edition, I still highly recommend a night-time boat tour of Amsterdam's canals for views that are just as special. If you have more time, walking around the Light Festival's route would also be something special to do. It would mean you would have more time perhaps to read about each installation and to absorb the journey in between each one. But you would perhaps need a few hours or more depending on how fast you like to walk (or appreciate art!). You should also remember that Amsterdam Light Festival takes place during December and January which are undeniably cold (ahem, FREEEEEEEEZING!) months in Amsterdam so we like how cycling keeps us all a little warmer too! We began our bike ride at a few minutes before sunset and I like how you can see all the photos get gradually darker... And my partner and son popping up on their bike in a few pics! And if you'd like some tips for cycling around Amsterdam's canals and beyond, I share some advice, unwritten rules and general tips for staying alive here but in general, stay to the right,don't use your bell to let your mates know you're having a good time and when taking photos keep off the road, but a safe distance from the canal!